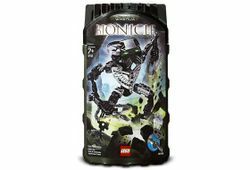 8738 Toa Hordika Whenua is a BIONICLE set released in 2005. He was one of the Toa Hordika. In this form, he has two Thumpers, a Rhotuka Spinner and Launcher. He is black with green eyes. In the BIONICLE universe he was a Toa of Earth. This is a description taken from LEGO.com. Please do not modify it. (see an archive of the product's page) He strikes from the shadows! Toa Hordika Whenua has seen the Archives shattered and beasts of every kind released on Metru Nui. Now he must fight to save the Rahi from extinction. His tools can summon beasts from far underground, or charge up his Rhotuka earth spinner. Includes instructions to build a Rahi cable crawler with #8738 and #8736! Facts about "8738 Toa Hordika Whenua"
He strikes from the shadows!